If you have a Canvas course export package from someone else that you want to use in Canvas, or you have previously exported a course, you can import the course as a Canvas course export package. 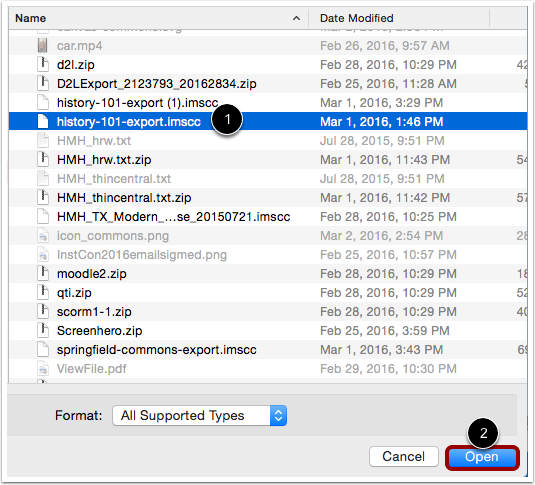 An export package is imported as an IMSCC file. When imported into a course, course exports have the same limitations as course imports. For more details, please see the import content section in the Canvas Basics Guide. When importing a Canvas course export package, the package will overwrite some of the existing course settings. For example, if your destination course is set up with a private copyright, and you import a package that has a creative commons (CC) copyright, the copyright license in the destination course will change from Private to CC. Please review the course setting after any course import to make sure important settings are still in place. Importing a course more than once may have unintended consequences. 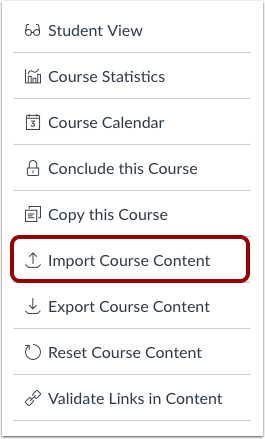 If you import content into a new course, edit the content in the new course, and later import the same content again, your new course will include both the edited and original content. Courses are allotted a specific file size limit for file storage. Your course export package file size must be smaller than the quota for your course as shown in course statistics. If you do not have enough storage space in your course to import the export package, please contact your Canvas administrator. 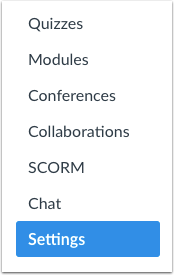 Instructors will need to manually subscribe to or enable notifications for discussions and announcements after importing them into a new course. In the Content Type drop-down menu, choose the Canvas Course Export Package option. Choose the .imscc file you want to import . Click the Open button . Previous Topic:How do I copy content from another Canvas course using the Course Import tool? Next Topic:How do I import content from Bb Vista/CE, WebCT 6+ into Canvas? Table of Contents > Course Import Tool > How do I import a Canvas course export package?